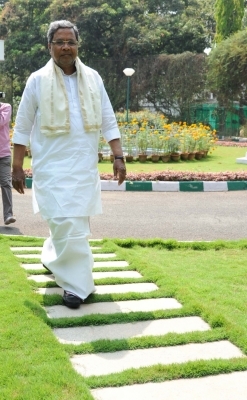 Bengaluru, Oct 27 (IANS) Karnataka Chief Minister Siddaramaiah on Friday ruled out the resignation of Cabinet Minister K.J. George against whom the CBI had filed an FIR for abetting the suicide of Deputy Superintendent of Police M.K. Ganapathy in July last year. “No need for George to resign. The FIR filed by the CBI is a continuation of the same registered at the local police station (Madikeri), which the state CID had investigated and gave George a clean chit in the case,” Siddaramaiah told reporters here. The Crime Investigation Department (CID) had “thoroughly” investigated the case, he said. Terming the Bharatiya Janata Party’s (BJP) demand for George’s resignation “politically motivated”, the Chief Minister asked why the central ministers against whom FIRs were filed and pending did not resign or were not sacked by Prime Minister Narendra Modi. “There are FIRs against at least 20 central ministers, including (Union Minister of State for Skill Development) Anantkumar Hegde and (Union Minister of State for Drinking Water and Sanitation) Ramesh Jigajinagi from Karnataka. Why have they not resigned?” questioned Siddaramaiah. “Why should George resign? He won’t. Let the central ministers resign first,” he reiterated. Siddaramaiah also referred to the criminal charges and cases filed against Uttar Pradesh Chief Minister Yogi Adityanath and other BJP lawmakers, including BJP’s state unit president B.S. Yeddyurappa. On the Supreme Court’s directive to the Central Bureau of Investigation to probe the case on September 5, the agency had registered a case of abetment of suicide against George and Additional Director-General of Police (Intelligence) A.M. Prasad and Inspector-General of Police Pranov Mohanty. Ganapathy had hanged himself on July 7, 2016 in Madikeri, about 250 km to the west of the state capital. Before his death, the police officer had accused George and the two senior police officers of harassing him.